Head over heels – What I’d be tripping over myself to do if I were a head teacher. Firstly, at present I am only a Head of Department, it is pretty essential I point that out for context. Mainly as I think we can all be idealistic if we are not in the position that we are about to start spouting about the amazing changes we would like to make. This post is about some of the things I think I would like to do if I were a head teacher. It is not all the things, just a few of the main ones that I have thought about over the time I have been a department head across a number of school. But let’s be idealistic for a while, God knows if I ever got there I’m sure I won’t get the chance then! Staff well-being is a big one for me and gets the honoured top spot. I was always idealist with my thoughts from a young age and often said to my mum “Why can’t we all just treat each other well”. Well I think well-being should be a massive focus for any school. I would instil well-being weeks and perks for my staff (and in-fact pupils and parents!). Don’t get me wrong, I learnt about intrinsic vs. extrinsic motivation at university in my psychology degree but who doesn’t like a little pick me up pressie in the pigeon hole or a thank you note hidden on your desk. 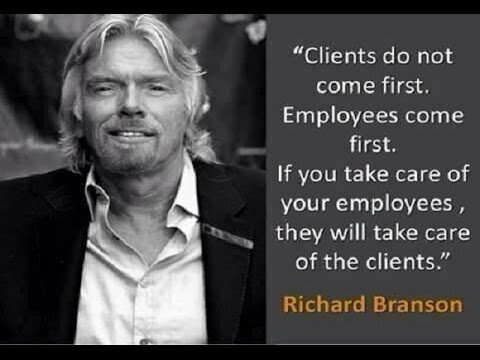 I will be looking at further ideas for this in a separate blog but generally I am with Richard Branson on this one (but I see employees as more than just staff ;-)). Knowing the stress I have always thought that I have no idea the stress and strain SLT have. It must be a killer at the top and I am impressed with whoever takes it on, no matter how good or bad they are when they get there. I think it’s one of those jobs that you can never understand until you are there…so let’s give a glimpse into the ivory tower of leadership. Let all staff attend SLT meeting! I feel having a chair in SLT meetings for a member of staff on some kind of rotation gives an insight into the dealings of the life of management (when it is relevant and not something confidential, might be just a slot rather than the whole meeting). This will not only let staff see if this is something they would like to aspire too (thinking CPD here!) but may also give the SLT into the practicality of their ideas “on the ground”. It’s not surprising that some SLT decisions might have practice problems that they might not know if they no longer teach full time and staff insight might save a lot of wasted time, or at least give another view to things! Working lunches! I know…sounds horrible! BUT…it’s not a working lunch but a natter catch up. Too many HODs get stuck in a room all day without other adult contact now days…how about we provide a lunch (free to get them out those rooms) to chat. No agenda, no minutes…just sharing good ideas. Now for the radical part…no SLT allowed. Let them feel free to give me a bashing as SLT, hopefully they won’t need to but if they do I’d rather have it off their chest. Allow an anonymous email account to send an email with any common issues or problems that come up. No one feels accountable and things get done. Problem pupils get identified, interventions shared and healthy lunch for all….win win situation. CPD to suit. Any CPD is limited in time it takes up but effective with the outcome it has. This links to my previous post but I am passionate about this! Plus the whole development is integrated, including well-being. Coffee and tea on tap. I don’t know why this is an issue for me but it is. Having been in two schools where it was provided and then taken away I just don’t get it. The last thing I needed to worry about was getting milk in the morning on the way to work. Is it essential for an SLT to worry about this…I think so. As SLT I need to know my basic staff needs are being met…after all who am I to question Maslow 😉 (don’t start on me about this…I know there are doubts in the theory!)? I know it cost…I am willing to pay. I hope if it was the decision between staff needs being met and school supplies from the budget then my own purse would be dusted off and used for the greater good. No meeting unless it’s needed! Let me start by saying sometimes meetings are needed and productive but in past schools I have been to them because they are on the calendar…not because they are needed. Let’s make a time for meetings (maybe radically in the school day rather than after sometimes) and then if it’s not needed let’s cancel! Mad I know! Going against sacred calendar! AGHHH! Really we all know this does happen. 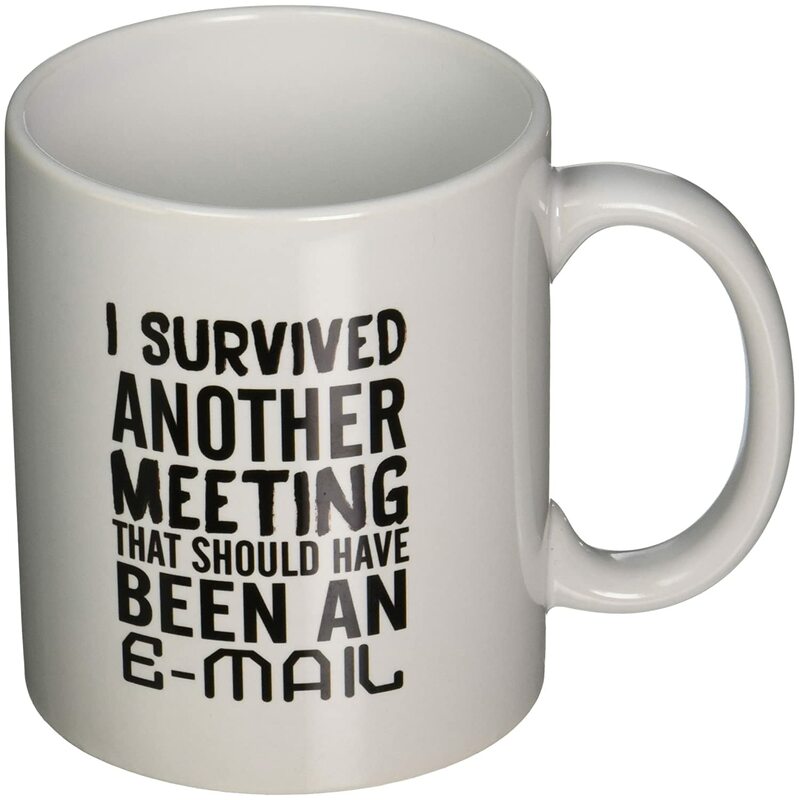 Luckily now I am in a place that sees the sense of calling off a meeting but in the past I have needed the mug below! We have other means at sharing ideas now…online surveys, padlet, chat forums, emails. Let’s use them and save us all some time. Lastly, and a big one that I am not sure I could back up….forget judgements. Work for the school…not the judges. OFSTED, ISI, whoever. Not because I am radically against them but because the tail can’t wag the dog….literally, I check with him, he said woof. But seriously, I can’t worry about this and neither can my staff. The judgement will ultimately be on me as a head. I choose the policies, I choose the staff…it’s on me. So I will worry…you will work and find enjoyment in it. I will support, not judge you. I am pretty keen that OFSTED lose those four judgements for school and make it a full written report of ideas on how to improve…I think the four category headings that are killing the school but I can’t change that. I can choose not to put a massive banner on my school not matter what the judgement (Outstanding or requires improvement). It doesn’t help my staff…I would hope I show them how proud I am all the time without a massive banner (although at points I like the idea of taking the special of special measures and making that massive and then making something of how my school are special as we are dancing to the beat of our own drum…but then again this might be a radical move too far). Plus I am hoping I have unique selling points in other areas to keep marketing happy…maybe like a whole hosts of little smiling faces as people enter the school…and I am not talking about the pupils! As I said, there are many more things that my inexperienced brain thinks about in the life of me as SLT…but a girl can dream (and maybe many of you SLT reading will be thinking….”dream on!”). If any SLT reading this takes a look at any and likes them…let me know in the comments below! Previous postThe CPD factor – it’s not one rule for them and another for us!